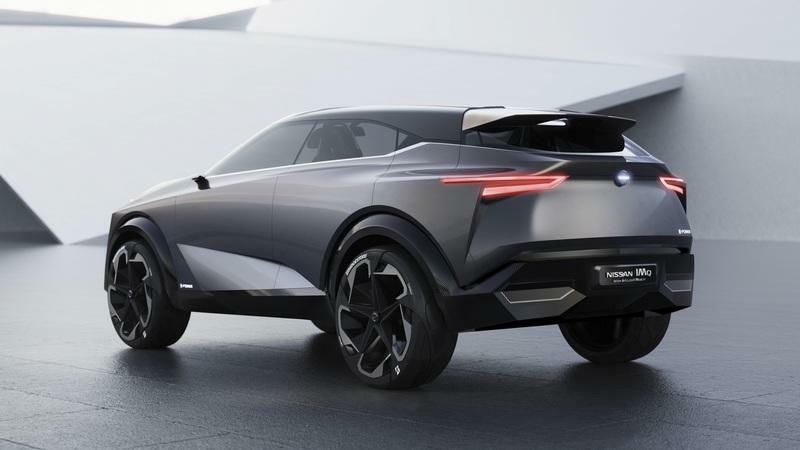 The Nissan IMq is a concept crossover that the Japanese firm unveiled at the 2019 Geneva Motor Show.Part of a series of IM-badged concepts that also include the IMs and IMx, the IMq previews an upcoming subcompact crossover, likely the second-generation Juke, but also "signals the direction" of Nissan’s next generation of SUVs. 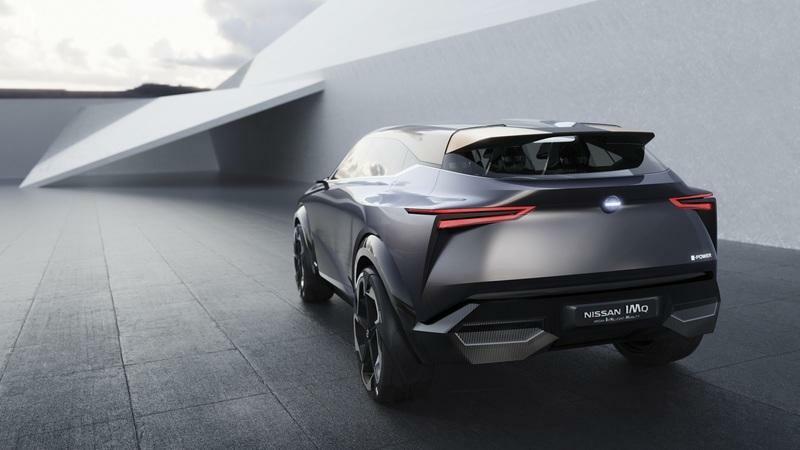 "Its styling reflects Nissan’s role as a pioneer and leader in crossovers, with a striking look that pushes the boundaries of what a European crossover can be," Nissan said, suggesting that the production version of the IMq will be Euro-spec only. This strengthens the scenario that it may preview a new Juke, which was replaced by the Kicks in the United States in 2018. On the other hand, it could also be a preview for the third-generation Qashqai, due in 2020. In the U.S., the Qashqai is sold as the Rogue Sport. Design-wise, the IMq looks unique compared to the IMs and IMx, which is a bit surprising to be honest. 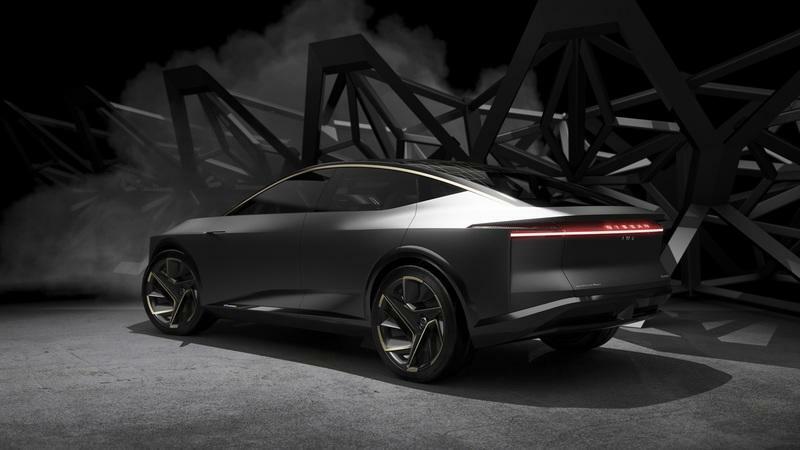 But the most surprising thing about this concept car is that it seems to borrow some features from current Lexus production cars. The way the headlamps are doubled by thin stripes in the bumper and the shape of the front grille remind me a lot of Toyota’s luxury division. But Nissan shaped these features in its own way. The headlamps are much slimmer than Lexus’, while the grille is made of really thin gills. And this is where things take a very unique turn. Not only the layout of the grille extends into the wide vent in the bumper, but it also blends into the front hood. Remember the joke about BMW kidney grilles growing so large that they will soon expand onto the hood and toward the windscreen? Well, Nissan is already doing it in concept form. As much as I don’t like outlandish grilles, I must admit I’m pleasantly intrigued by the IMq’s front-end design. Things become weird onto the sides though. While I’m fully aware of modern tendencies to add massive wheels and wheel arches to concept SUVs, the IMq looks awkward due to its tall waistline and low roof. The muscular rear fenders are a nice touch though, as is the big "pocket" cut above the side skirt. But hey, concepts are supposed to be intriguing, so I’m pretty sure Nissan got the reactions it was looking for with this show car. The IMq’s rear end looks like that of high-performance hatchback. The flat rear window is shaded by a big roof spoiler, while the beltline extends to form an integrated spoiler just above the fascia. The fascia itself is tall and clean, a big contrast compared to the skinny and V-shaped taillights. The bumper is mostly made of thin vertical gills, just like the front grille. There’s no diffuser or exhaust pipes, but semi-transparent look provided by the gills is impressive to say the least. Needless to say, the IMq will never win a design award in my book, but there are certain features that I like. With certain changes, Nissan could turn this concept into an award-winning production model. Getting inside the IMq is much easier compared to production cars simply because the doors are hinged at their outer edges. This means means that they open wider than usual, so your passengers don’t have to squeeze between an opened door and a pillar. Once the doors are opened it’s easy to notice why the IMq is a concept vehicle. Both the seats and the center console are suspended high above the floor, creating the impression of a lounge-style interior. The fact that there are only two rear seats further enhances this feeling that the IMq is a comfortable vehicle for four. The seats are quite sporty. They include heavy side bolstering, integrated headrests, and an ergonomically shaped seating surface. The floor mimics the gill pattern of the front grille and rear bumper, a cool and unique idea. The "gliding wing" dashboard is based on a design that Nissan introduced in previous concept cars, but everything else beyond the shape is new. The irregularly shaped display is no less than 33 inches wide at the top, a section that stretches over almost the entire width of the dash. A second screen placed above center console incorporates what Nissan calls the Virtual Personal Assistant. This feature "enhances the driving experience by controlling vehicle functions, such as navigation, in response to input from the driver." I’m not sure what that means, but it’s probably a fancy way to say that it’s an infotainment display. The concept is equipped with Invisible-to-Visible technology, a 3D interface where the "real world converges with the virtual world." The steering wheel is far from regular too. Instead of the usual round rim, Nissan went with the race-inspired flat top and bottom. But it sits a bit lower than usual, which is supposed to maximize visibility toward both the road and the dashboard. Nissan also crafted a new generation of soft-touch paddles for shifting on the back of the steering wheel. Unlike most modern production cars, the IMq features clean door panels. They’re not completely featureless as they’re split into two sections finished in different colors and with different materials, but there are no handles, no pockets, and no buttons. 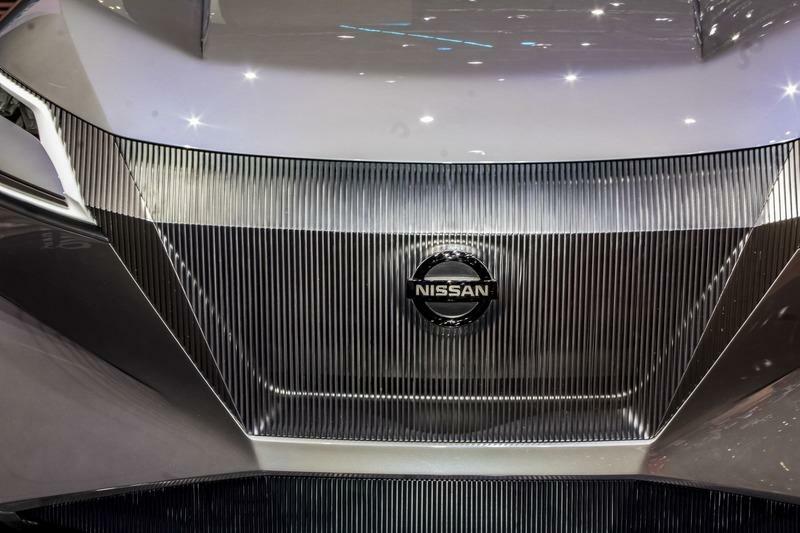 Nissan says the concept is equipped with Invisible-to-Visible (I2V) technology, a 3D interface where the "real world converges with the virtual world." This system helps vehicle occupants "see what may otherwise be invisible" thanks to Nissan’s Omni-Sensing technology which connects the IMq to real-world sensing information inside and outside the cabin. The technology can help drivers see around corners or find out precise information about traffic jams. Interestingly enough, the cabin can also project a virtual passenger in the form of a 3D augmented-reality avatar. Just in case you’re feeling lonely. 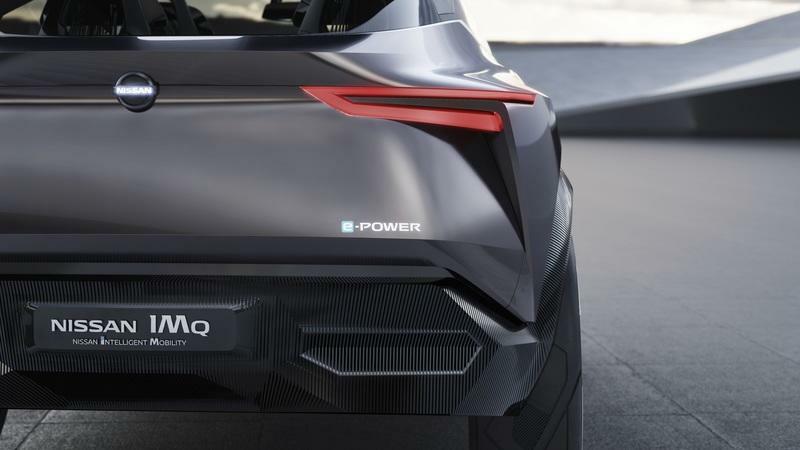 Nissan didn’t dive into too many details here, but it did say that the IMq features a next-generation e-Power drivetrain. This electrified concept may be new in Europe and the U.S., but Nissan is already using it in Japan in the Note e-Power and a minivan called Serena. 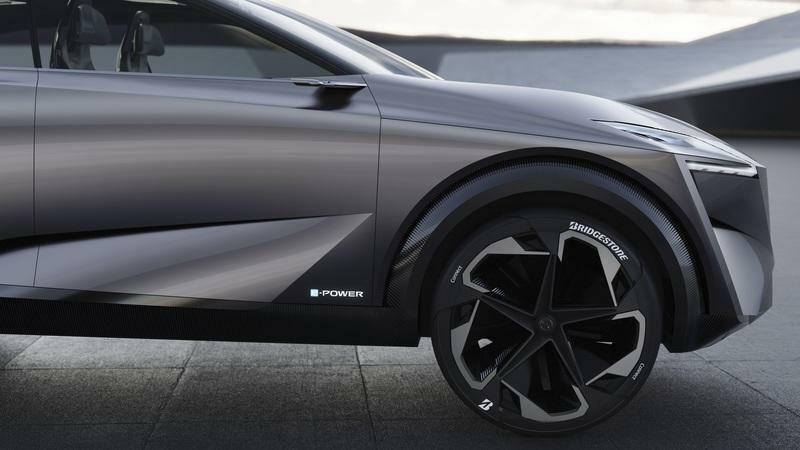 The Japanese firm calls it a "100% electric motor drive system," but this doesn’t mean that the IMq is fully electric. 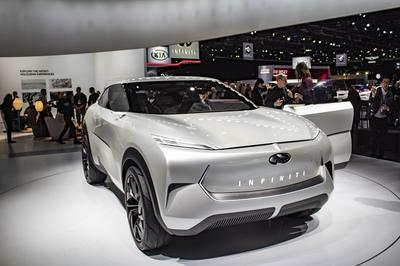 The e-Power system in this concept and Nissan’s Japan-spec production cars are actually closer to hybrid. While electric motors are used to spin the wheels, the battery is being charged by a gasoline engine. Nissan says the IMq powertrain has been further developed from the e-Power technology in the Note and Serena, but it doesn’t mention whether the gasoline engine was dropped or not. What we do know is that the IMq has more than one electric motor because it features a "multi-motor all-wheel-drive system." 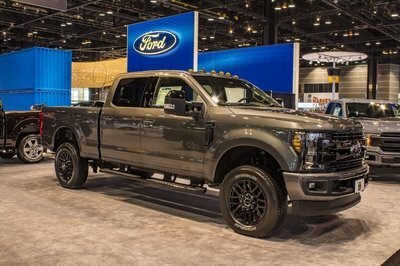 It’s also notably more powerful than the old drivetrain at 335 horsepower and 516 pound-feet of torque. That’s more than most electric cars on the market today, with only Tesla and sports car manufacturers providing more oomph from electric motors. No word on performance and range, but it should exceed the ratings of the production-spec Nissan Leaf. The IMq is also fitted with an advanced prototype version of ProPilot, Nissan’s driving assistance system that can offer autonomous driving capability. It combines an array of advanced sensors, radars and cameras located throughout the car that can "read and interpret" road, traffic, and information signals for safe autonomous driving on both city streets and highway. A slightly improved version of the IMq’s ProPilot will probably find its way into a production model in a couple of years. The IMq is by far the most controversial of Nissan’s IM concepts so far, but it’s also far more interesting than its predecessors. 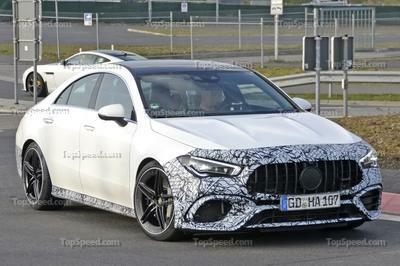 The connectivity system is impressive to say the least and the massive 33-inch screen could solve many design and ergonomic issues of modern cars. Sure, it’s way too expensive to be offered in a vehicle that doesn’t compete in the premium segment, but as costs for pretty much everything car-related are going down, it should be a viable option in just a couple of years. 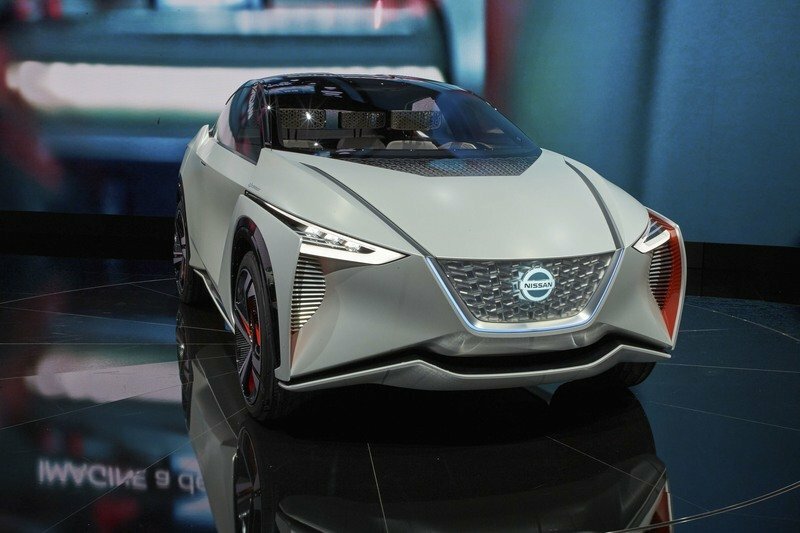 The potent electric drivetrain and the advanced autonomous system add to the IMq’s appeal and signal big changes in Nissan production cars in the future. 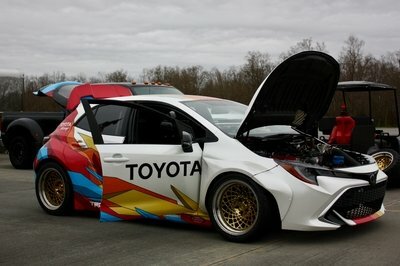 Is it actually a hybrid? 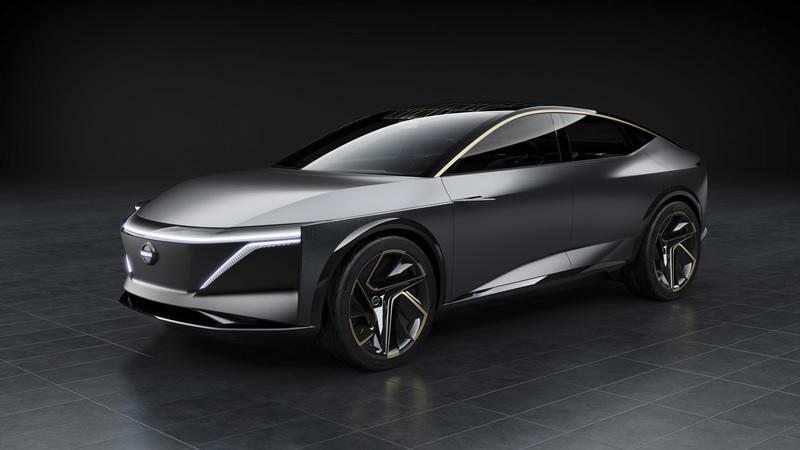 Will Futuristic Nissan IMS EC Sport Sedan Concept Save Sedans? 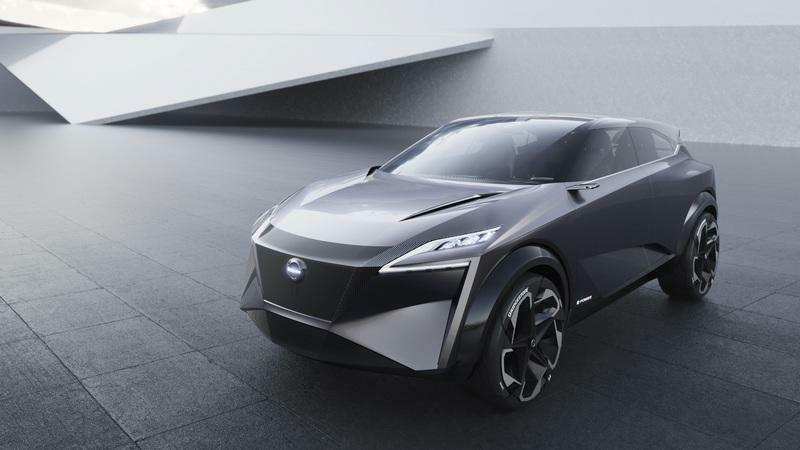 Read more details about the 2019 Nissan IMs concept. Read our full review on the 2017 Nissan IMx.